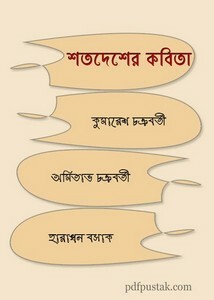 'Shatadesher Kabita' is a several countries poetry collection, poetry collection from differents lands. The book edited by Kumaresh Chakrabarti, Amitav Chakrabarti, Haradhan Basak. And all poems are translated into Bangla by so many authors as Manindra Roy, Mayukh Basu, Ajit Dutta, Premendra Mitra, Ajoy Sen, Tarun Sen, Paresh Saha, Subho Basu, Dakhinaranjan Basu, Pulak Chandra, Jiban Sarkar and many more. Collect this Kabita boi as pdf file from following link.